Protein foods are something all of us should include in our daily diet. We may get our protein from conventional sources such as eggs, dairy products, and red meat. But there are some alternatives that you can try. If you’re tired of eating the usual fare to get your daily protein quota, you could try a protein shake. They’re a great way to replace existing protein intake or the ideal way to replenish your protein levels after a strenuous workout. Proteins contain rich concentrations of amino acids. Amino acids are an integral part of all the cells and tissue in your body. They also contain vital enzymes and antibodies that feed the immune system allowing it to fight off threats posed by germs, bacteria, and viruses. That’s why it’s important to make sure you include enough proteins in your diet. Your recommended protein intake differs from person to person because it is calculated according to your weight. The Dietary Reference intake indicates that your body needs 0.8g of protein per kilogram of body weight. That’s 0.56g of protein per pound of body weight. Consuming more than this means that the excess is stored as fat which can lead to weight gain. The extra amino acids in your body from consuming too much protein are expelled from the body as waste. There are plenty of protein shake recipes for you to choose from. Most require some protein powder which you can purchase at your local health store. Try some of these, then mix and match them to suit your own tastes. This smoothie is both healthy and able to satisfy a sweet tooth. If you’ve been indulging in too many sweet desserts, you’ll want to cut back to lose weight. 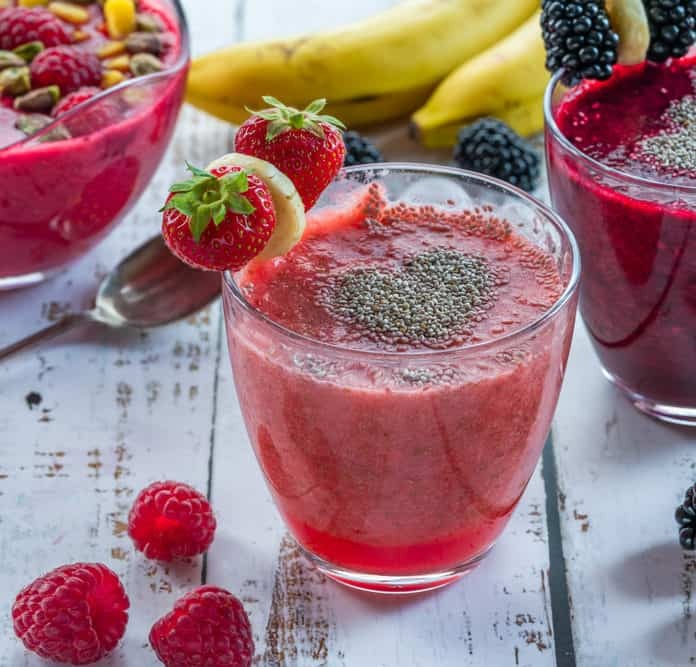 This smoothie is the perfect way to start because it’s delicious but rich in the protein you need as well. Keep this smoothie in mind for those times where you feel you’ve earned a cheat treat. It’s sweet and divinely tasty, but not full of unhealthy ingredients. Use a high-speed blender to combine all the ingredients until smooth. You can add some freshly sliced fruit, whipped coconut cream, or chocolate drizzle. For the purposes of environmental friendliness, serve the smoothie in a glass with a paper straw. Multiply the ingredients if you want to make more than one. But take your blender size into account. You might have to make each one separately.